The Russian Defense Ministry has denied allegations reported by the AP that Russia is constructing an army base in the ancient city of Palmyra, which has recently been freed from Islamic State. “There are no ‘new army bases’ on the territory of the Syrian town of Palmyra and there will never be,” Defense Ministry spokesman Major-General Igor Konashenkov said in an official statement on Tuesday. Earlier in the day, the AP news agency came out with a report stating that the Russian military is building an army base in Palmyra within the zone listed by UNESCO as a world heritage site, and without permission from authorities. The agency cited an “American heritage organization” and a “top Syrian archaeologist” as its sources, as well as satellite images that appear to show some construction on the edge of the ancient site. Yet, as General Konashenkov states, the pictures show something else entirely. 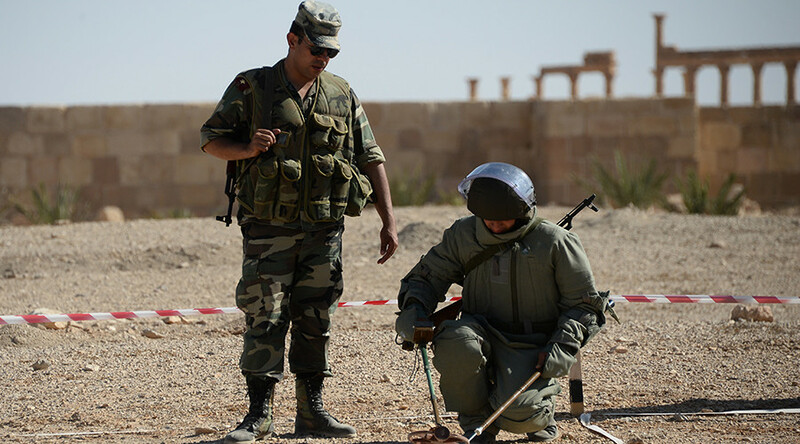 The installation of this temporary camp until the area is cleared of explosives has been approved at the Ministry of Culture and other official departments of the Syrian State,” Konashenkov pointed out. Palmyra was captured by jihadist in May of 2015. The Syrian Army backed by Russian forces managed to recapture the city on March 27th of this year, an event largely viewed as a victory and turning point in the war against the terrorists in Syria. During 10 months of brigandry, executions, and other types of savagery, many ancient monuments were damaged to a worse extent than during all of the centuries they had stood there. A number of remarkable monuments, including the Arch of Triumph, the Temple of Baalshamin, and the iconic 2,000-year-old Bel Temple, are now in ruins. Moreover, the city and adjacent territories were left ridden with explosive devices, which have now been largely demined by Russian sappers. A Russian-drafted resolution on the role of UNESCO in restoring the devastated ancient city of Palmyra back to its former glory was unanimously approved by the organization in April, with restoration work set to begin when the area is fully cleared of mines. R ~ My advice to Russia when the jew press makes yet another false allegation - ignore them, otherwise you'll be on defense for eternity. It's a typical jew tactic that deserves no answer. The unnamed American heritage organization, if it even exists or has the balls to be in Palmyra hasn't been quoted as thanking the Russians for their excellent work in clearing out the mines. Maybe they should have left a few surrounding this 'heritage organization' where ever they camped.